.. site as it appeared in 2007. .. pictured are Ron Kinsella & Bob Brown, members of the Fire Place History Club. (1939 description) "Three tombstones in the southeast corner of the old Rider place, later owned by the Booth family at Squassux and directly north of the barnyard of Alan G. Baker on the south side of Beaver Dam Road, Brookhaven village." In 2007, it was found located on the north side of the Puleston-Clement farm about fifty feet east of Meadow Lane. It is not being maintained and is in poor condition. This small family burial site is subject to complete loss by the next generation. The 1939 Town of Brookhaven survey recorded that there were three gravestones on the site. However, when visited on 28 Feb 2007 by John Deitz and Marty Van Lith, only two could be found. An archaeological study might find a third. 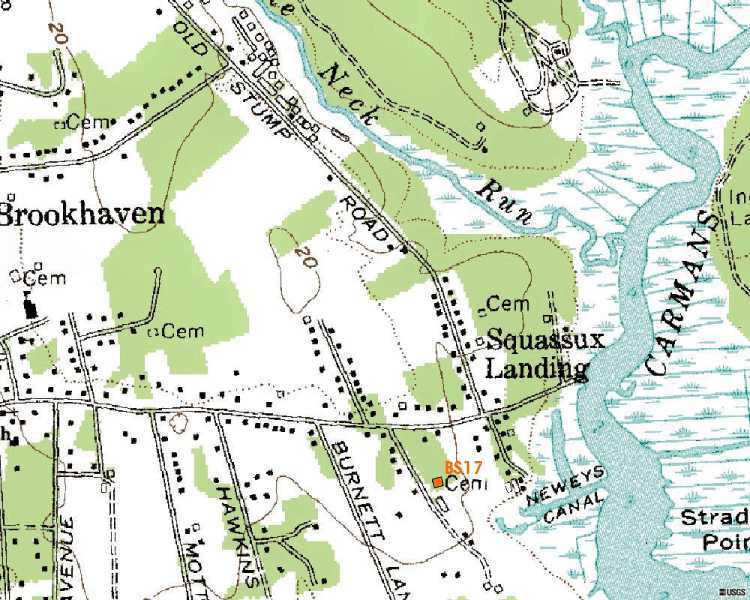 It is #S17 on the Town of Brookhaven Historians Cemetery List, has Suffolk County Tax Map reference 200-976.40-01-12, and has Historic Site ID Br30.1-S. It is approximately located at Latitude N40° 46.296' Longitude W72° 54.048'. An inspection on 24 Sep 2007 indicated two new survey monuments, probably at the southeast and southwest corners of the site.